Medieval calendars followed the Roman system of kalends, nones and ides, which originally was based on phases of the moon to divide the month into three parts. The first day of the month was the kalends: this is why a large 'K' usually stands at the beginning of a medieval calendar page. Here is the page in Abroath's calendar for March and April. 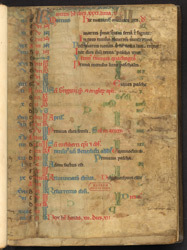 It presents a wealth of information on which medieval monks depended to determine the dates of feasts, schedule their prayers for services and determine favourable times for various activities: phases of the moon, number of days and hours of daylight in the month, astrological signs, saints' feast days and other dates of importance, such as "Adam was made." Important saints' days were written in blue or red, such as the feast of St Cuthbert. A little farther up, a note marks the entry of the sun into the zodiacal sign of Aries.